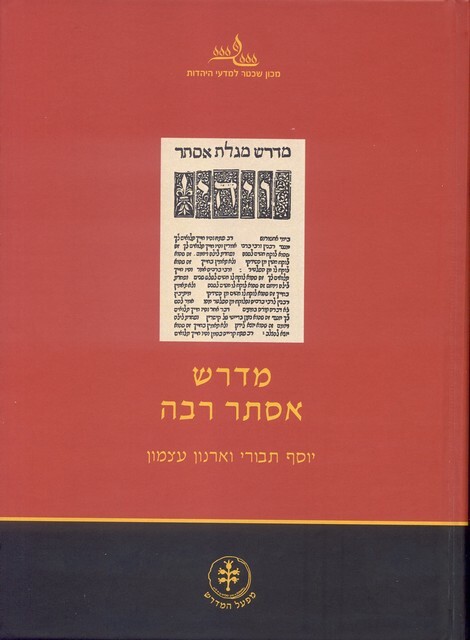 For a number of years now students of aggadah have been waiting to see the publication of a number of scholarly editions of classical midrashim. Some of the most anticipated volumes include Tamar Kadari’s edition of Canticles Rabbah, Paul Mandel’s edition of Lamentations Rabbah, Marc Hirschman and Reuven Kiperwasser’s edition of Ecclesiastes Rabbah, and Joseph Tabory and Arnon Atzmon’s edition of Esther Rabbah. All of these editions are part of the Schechter Institute of Jewish Study’s Midrash Project, and some of the synopses are already available online on the project website. The recent publication of Midrash Esther Rabbah is the third volume of this ambitious series to come out. Now, we can continue to enjoy the fruits of this endeavor and whet our appetite for future volumes. Tabory and Atzmon’s volume is elegant, and inviting to professional scholar and lay learner alike. The print is clean, the layout is (certainly for a scholarly edition) blessedly uncluttered, and the commentary is crisp and generally to the point. The reading experience could be best described as streamlined. One can hurry along the text at a nice clip, glancing just below to check parallels in rabbinic literature (both “classical” and the later collections); look further down to consider major differences in the manuscripts, and then, on to the bottom of the page, consult a conveniently organized commentary. Though the presentation is effortless, it is obvious that each of these sections reflects an enormous amount of work. The edition is eclectic and based primarily on the six major (relatively late) manuscripts of the midrash to have survived. The variae lectiones collected in the relevant section are a selection of only those variants which the editors deemed to be important. But philologists have no fear (unless, as one prominent scholar recently complained to me, you are Shabbat observant and it is Saturday), you can access the complete synopsis online. In an introductory chapter the editors describe each witness and also propose a stemma for understanding the relationship between them. They argue that the extant manuscripts descend from one textual parent, since all the manuscripts share the same group of clear mistakes. Though I did not check the accuracy of the transcriptions against images of the manuscripts, all around the textual reasoning seemed sound. פרס – למה קורין אותה פרס? שקבלה את המלכות פרוסות פרוסות, אחד בימי תרדה, ואחד בימי ארדכיאן, ואחד לעתיד לבוא הה”ד: והיה זה שלום אשור כי יבוא בארצנו. The readings תרדה and ארדכיאן are almost surely mistakes. As the editors note in the commentary, ארדכיאן is quite possibly a reference to the last Parthian king, Ardavan (who indeed shows up elsewhere in rabbinic literature as the subject of Rav’s lament). In fact, the better (though still inexact) form ארדביאן is recorded in MS Cambridge. Similarly, תרדה is likely a reference to a king named Mithradates (there are a number of candidates, as this was a popular name for Iranian-named kings – Parthian and otherwise) and should probably read מתרדה. While one appreciates the editors’ caution by keeping the problematic readings, given the eclectic nature of the edition I would have expected that these readings would be corrected in the main text, and then accordingly marked as emended. In his magnum opus, Eliezer Segal, discusses a parallel in the Babylonian Esther Midrash (bMeg 11a) and uses the apparent #GeographicEpicFail to make a large claim about the construction of the pericope both in the Bavli and in Esther Rabbah. Without drawing much attention, Tabory and Atzmon nonchalantly suggest that the rabbis understood the verse to refer to the Northern Indian hill country, known as Kush. Indeed, when teaching the Babylonian Esther Midrash a few years ago I realized that the official name of the two neighboring provinces during Sasanian times were Hindustan and Kushan. In the Bavli’s version, the identity of הודו and כוש is in fact debated between Rav and Shmuel (one of whom correctly identifies כוש with Ethiopia). There is nothing at all surprising about a Babylonian amora knowing a thing or two about the technicalities of Sasanian geography and thereby making the initially surprising association between כוש and Kushan. There would be something a bit strange about a Palestinian midrash making the link for no obvious reason. In other words, this is one of the myriad of instances where questions of influence and its direction between rabbinic corpora could be raised. This, however, is emphatically not the purpose of the new edition of Esther Rabbah. Indeed, while some scholars will reach for this volume “for its own sake,” others will often be animated by questions of literary history. When was the Esther Midrash put together? Where? How? In the above example, did the redactors of the midrash simply rework a tradition that is attributed in the Bavli to a first generation Babylonian amora? Or did the Bavli borrow from Esther Rabbah? Was their a common source? Was there a large pool of related yet distinct traditions that both corpora pulled from? For general questions like these the reader can consult the comprehensive chapters at the beginning of the edition. There one finds alongside clear discussion of the midrash’s structure (as it turns out, the original midrash is top heavy and covered in 6 parshiyot just the first two chapters of the biblical book) lengthy essays on other midrashim to the Book of Esther, the diffusion of Esther Rabbah in medieval times, and other, related sundry topics. Importantly, these are not merely of tangential interest, since the existence of so many Esther midrashim, for example, greatly complicates the recovery and dating of the Esther Rabbah. What is more, these parallel Esther midrashim are not at all static, and we often find traditions move to and fro between the corpora. Needless to say, such a fluid situation makes the reconstruction of Esther Rabbah extremely challenging. Apropos matters of dating, the editors wisely steer clear of tying themselves down to anything too early or too late. Many of the well-known debates are appropriately cited, though it can be a bit frustrating when the issues are presented in ventriloquy through the mouths of Zunz, Albeck, and Co. The upshot is that when it comes to questions of literary relations, one normally has to suffice with the editors’ basic references to parallels, and very occasional discussion in the commentary. Tabory and Atzmon quite obviously made an editorial decision here to cut down on verbiage and produce a neater volume, instead of shooting for something like the Theodor-Albeck Genesis Rabbah. That is good and fine. They have provided us with a gorgeous edition with room for our research to grow. Overall, this new edition is a great pleasure to work with – and to learn from, beginning to end. No doubt it will be the fountainhead from where all future research on the literary history of Esther midrashim begin. When read on its own, this midrash will ever-beguile you with its playful hermeneutics (another valuable introductory chapter outlines Esther Rabbah’s many different interpretive strategies) and surprising traditions. When you get a chance to look at the copy, enjoy the Antinonus and Rabbi story on p. 43. And in honor of Purim (and Bibi’s speech in congress), here’s a trivia question for you: Which nation does Esther Rabbah think scratches the most, and why? First person to cite the correct answer in the comments wins.